Adam and I met about 10 years ago now.&bsp; Life did its thing for a while and then we started seeing each other seriously about 5 years ago.&bsp; On Valentine's day 2006 he proposed at a dinner at our first-date restaurant with his grandmother's Miner cut diamond ring (just for those interested in shiny bits! 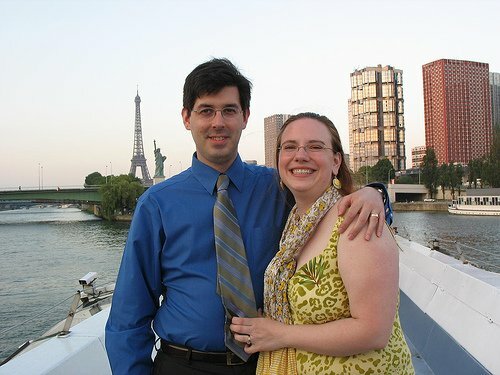 ).&bsp; We got married at a VERY small church ceremony in December 2006 and celebrated with a huge BBQ at a local park the next summer after taking a honeymoon to France in the Spring.&bsp; I'm looking forward to celebrating 3 years this December! !&bsp; We go all over together and I wouldn't have it any other way.&bsp; He even comes to take magnificent photos of my belly dance shows!&bsp; I'm indeed an incredibly lucky woman and Adam D tells me that HE is the lucky one.&bsp; I guess we both are! !